How do you show your gratitude to those who gave America these can’t-miss traditions: Christmas trees, Easter Bunnies, and Santa? Well, some things are invaluable, but we certainly try our best to pay our respects with German-American Heritage Month. It is celebrated in October every year to honor the contributions of America’s largest ethnic community. Throughout the nation there are Oktoberfests, German festivals, and German Day. This is the perfect time to experience the essence of German-American culture. The German Day custom had died after its inception due to anti-German sentiment during the war years. But Ronald Reagan revived this day. Later, after several years, German Day became a part of German Month — which is celebrated in October every year. The outbreak of World War II brought strong anti-German feelings to the U.S. In the ensuing years Germans were afraid to talk openly about their ancestry. Many German refugees fled to the U.S. when the Nazi party took control of Germany. German Day was first celebrated on October 6 — marking the 200th anniversary of the arrival of the settlers from Krefeld to America. And that’s what it was literally called – Germantown! This town in Pennsylvania was the first German settlement created in the original 13 American colonies. Seek out one near you and get set for some fun and tasty new experiences. Thomas Mann, Günter Grass, Bertolt Brecht, and other famous writers are Germany's gift to world literature. This impressive museum in Washington D.C. traces the path of German immigrants who came to this nation and achieved the American dream. The quintessential American hamburger, as the name suggests, comes from Hamburg, Germany! The world sees it as American and so far no German has complained. John Roebling, an engineer and German immigrant, was responsible for building New York City's iconic bridge connecting Manhattan and Brooklyn. They put the "K" in K-12. German immigrants in Wisconsin built America's first kindergarten. Before the Germans arrived in America many Christians observed the Puritan Sabbath. Germans, however, took a much lighter approach to their Sunday outings. The result? Many recreational facilities began sprouting up in U.S. cities. We devour 150 million hot dogs every 4th of July! And what's a day at the ballpark without them? German immigrants have influenced us in more ways than we can imagine. When they left their home they brought their religious beliefs, food, music, and art — leaving indelible marks on our culture. 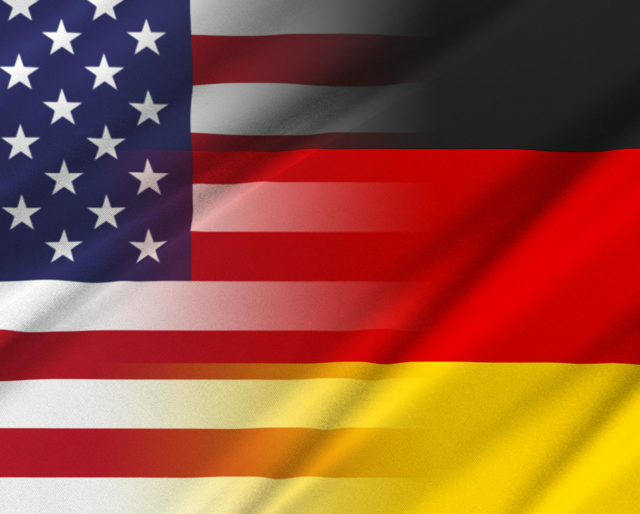 German-Americans have distinguished themselves in a wide variety of areas. They built cars, churches, and started apparel empires — while influencing art, politics and more. Lager beer, tasty bratwurst, creamy sauerkraut, sausages, and pretzels — the list could go on! Once a year you can feast on these at any German fest.